SATURDAY was a big day at Seapoint golf club with captains Andy Maguire and Breeda Moore driving in for the year ahead. The members also took the opportunity to launch the new five-day membership, at a cost of € 600 a year. The championship 18hole links course, designed by top Irish golfers Des Smyth and Declan Branigan, provides all year round golf on a top quality course, which backs on to Co Louth Golf Club in Baltray, just a few minutes drive from Drogheda and the M1 Motorway. Peter Jordan, Chairman of the Joint Committee, said that Seapoint was tackling the recession head-on with a number of unique packages that attracts new business and keeps the cost of golf down for its members and visitors. 'We are inviting golfers in the Greater Dublin area to consider joining our club as a five-day member for an annual subscription fee of € 600. 'We have a small entry fee of € 3,500 and the fiveday member will be entitled to play our great course Monday to Friday any time of the year. 'So if you play the course 12 times a year you are actually saving money, as our mid week green fees are currently e60,' he said at the Captains drive in. 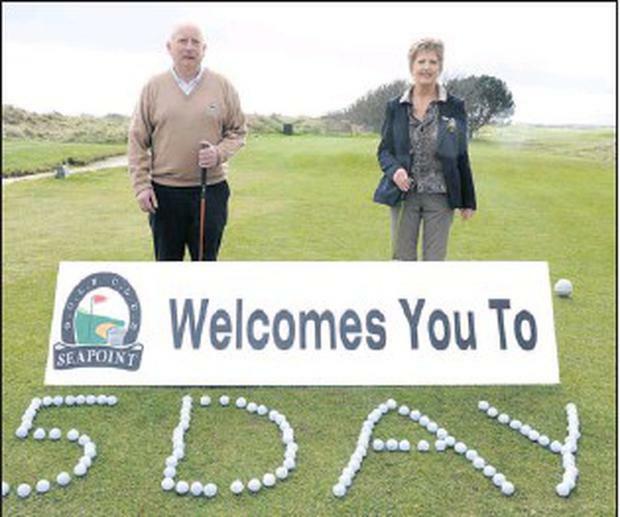 Captain Andy McGuire and Lady Captain Breda Moore said that, like all golf clubs, Seapoint was keeping a close eye on costs and tackling the recession by offering value for money for members and visitors. 'We are working hard to stay out of the recession bunker. 'However we are fortunate that we are a buoyant and successful club. 'So the challenge for us is to attract more business and keep the annual subscriptions within reach of the members. We appreciate that many golfers have family and mortgage commitments and it is important that we keep their golfing costs down,' Andy explained. This five-day membership price is a limited introductory offer and is on a first come basis. Applications must be submitted before March 31st.